Here’s an example of Mother Natures Madness. No-see-ums swarm in, I’m told mosquitos and love bugs eat no-see-ums and come in behind them like a cleaning crew. The mosquitos get eaten by minnows as they dip down in the water to lay their larva and love bugs fall in the water by the thousands and get eaten by minnows, from storms, boats, wind, etc. It’s harder for them to fly when they are in the act of love. 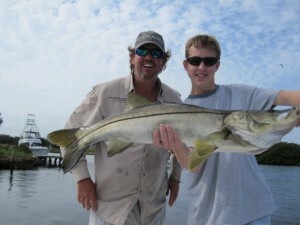 Pinfish, green backs, sand perch, ladyfish, all feed on minnows, and the above baitfish are all snook candy. March is a feast for all. Here’s some more things to check out. 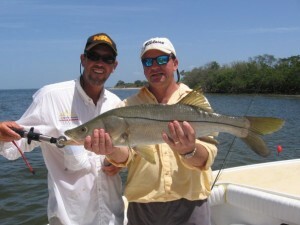 When you see love bugs in late March, start looking for tarpon. When the white pelicans leave us and migrate back north, look for the trout and reds bunching up on the grass flats and estuary mouths. When you start seeing big thread fins at the makers, cans, bouys, and bridges look for big spanish mackerel and kingfish, and big sharks, if you see tarpon “match the hatch” and cast big thread fins ONLY . When the moon goes full in early march go out night snapper fishing, chum like crazy with 1 x 1 inch cut thread fins on a slackish tide either incoming or outgoing and shine your light down on the big maroon colored ball of mangrove snapper behind your boat. Use 4lb to 8lb mono clear leader tied with a loop knot to a 1/0 Mustad “J” hook hidden in your cut bait and send it down with your chum into the ball of big mangrove snapper, that’s fishing! It gets me excited even writing about it, I’m thinking Everglades Seasoning, melted butter, squeezing key limes, and horse raddish cocktail sauce or Hooks famous yum, yum tarter sauce, deep fried mangrove snapper filets, yummy! Look for those rip tides when the winds blow one way and the tide streams the opposite direction. Baitfish get caught and worn out in the rip tide and the gamefish are on standby to take advantage of the situation. Fish the flow, trout and snook are ambush preditors. These game fish live to see a baitfish come struggling by caught in a heavy current while the gamefish is hunched down between a wad of mangrove roots, lime stone ledge or an oyster bar slope. Good luck fishing during this glorious time of the year! Ana Banana Fishing Company is with Kristen Kozay. Ana Banana Fishing Company is with Joel Brandenburg.